Touch of Ginger was approached by Warren Traeger, a close friend and mentor from the London 2012 Olympics, to see if we could create a suitable medal as a keepsake for the 65 participants. 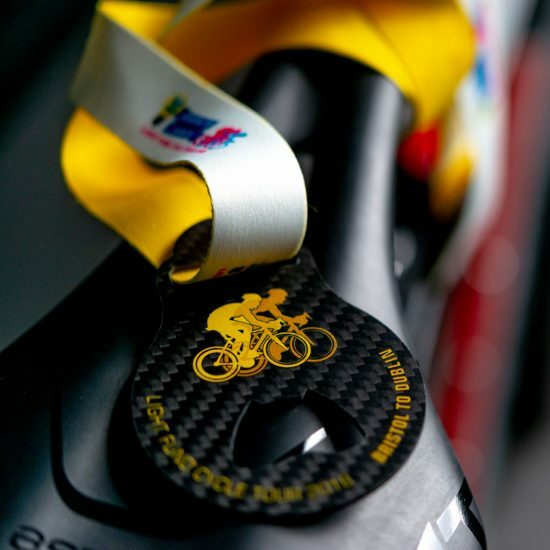 With very little time to design and manufacture the medals, we proposed an unusual solution – a medal machined from ultra light carbon fibre sheet featuring a handy bottle opener. The Light Fund’s Bristol to Dublin bike ride fundraiser was an epic 4 day 325m bike ride from Bristol to Dublin involving 65 licensing executives from across the UK industry. Touch of Ginger was approached by Warren Traeger, a close friend and mentor from the London 2012 Olympics, to see if we could create a suitable medal as a keepsake for the 65 participants. Warren would be putting in some hard miles on his bike so we felt we should step up too! 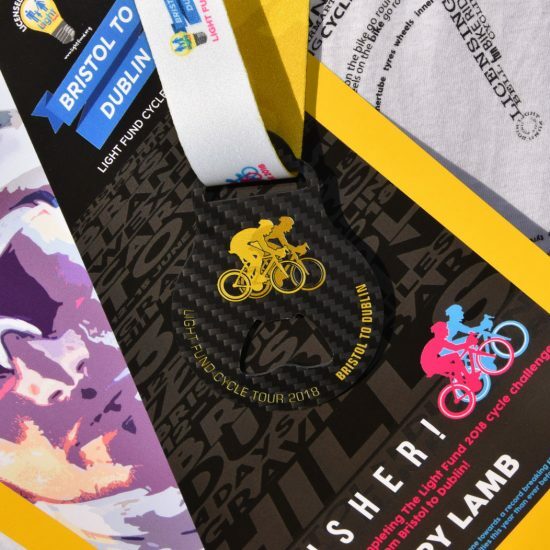 With very little time to design and manufacture the medals, we proposed an unusual solution – a medal machined from ultra light carbon fibre sheet featuring a handy bottle opener – all things close to the hearts of cyclists. Most serious road bikes are made from carbon fibre these days and for good reason. The material is super strong, super light and can be moulded into stylish one piece frame designs that can be both rigid and aerodynamic. 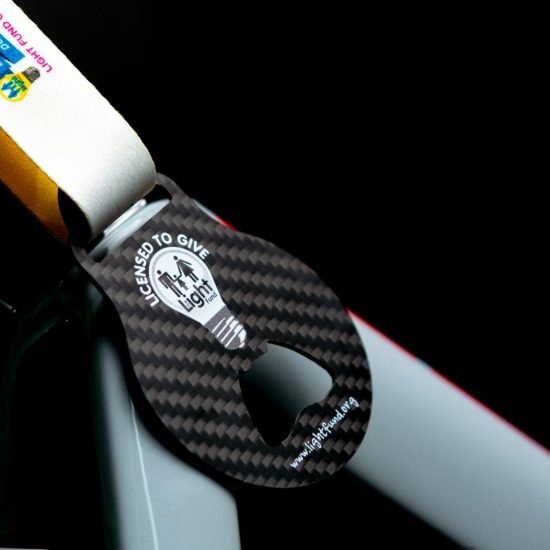 The medal takes the form of a light bulb (referencing the Light Fund logo) and features a cool bottle opener so riders can celebrate with a well earned bottle of Guinness (other beers available). Both the medal and the 25mm wide ribbon are digitally printed to offer full colour graphical content. This is important because the Light Fund logo is very colourful. We like that the ribbon features yellow on the rear to pick up on the yellow of one of the main sponsors; National Geographic. The ride raised a massive £200k for various good causes, and if you would like to donate you can do so here.